← PAINTING BAD FOR YOUR HEALTH! Sleep deprivation! 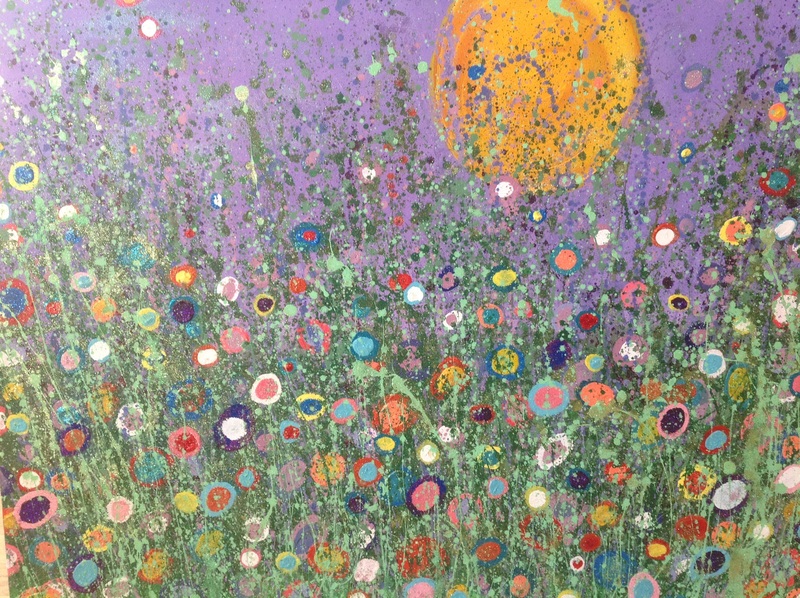 This was a fun piece to create, inspired by a patient a few years ago that touched my heart, he had admired an artist work called Yvonne coomber , this is in his memory.Every patient that wished to help was able to paint a number of flowers using just their finger, in a variety of colours and size. Lots of space needed for this canvas, which has about 8 layers of acrylic paint. It started as a recycled donated canvas, so the background and sun needed to be quite dark, painted with a roller ( as the previous dark blacks and reds kept popping through the original light blue and pale sun that was the original intention). The grass is assorted greens flicked with a large paintbrush( diy emulsion brush) very messy, best done outside. Then the first layer of flowers, after that more flicking of grass, then some more flowers, etc etc, we kept repeating the process so that eventually about 30 people had all put their mark on the vibrant painting. The fun bit was the addition of lots of glitter ( can’t get enough of it). I think it looks great, and on the wall it sparkles in the light, a bright outlook even on a dull day. This entry was posted in Acrylic painting, art, Flowers, glitter, group work, Uncategorized and tagged acrylic painting, art, flowers, glitter, group work. Bookmark the permalink.